This is moving quite quickly, despite interruptions. I try to plan for interruptions and if I'm lucky I can get to a stage where paper and paint need to dry, before I have to walk away. It's good to have time away, as you can lose sight of your goal and end up over-working the painting. So regular breaks are necessary. Just because I haven't got a brush in my hand, doesn't mean I'm not working on it though, it's all going on in my head so when I go back to it, I know exactly what I need to do. Here I've been strengthening the shadows and just bringing the whole painting up to the same level. If I don't do this, and just paint separate items until they are finished, I find that the painting never really 'gels' for me. there's also a danger I'll take some parts too far - usually the wrong ones! In this picture you can see I've been strengthening the colours and continuing the modelling in colour on top of the shadow colour. 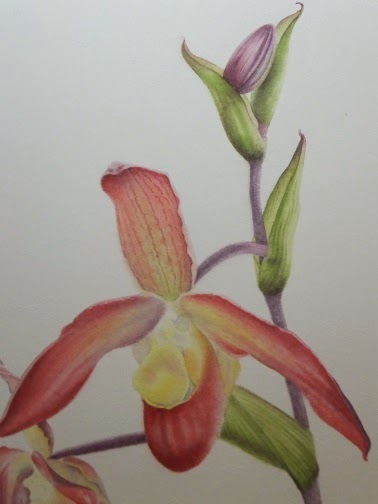 That top stem under the bud has become too dark, so I'm going to have to take out some of the colour - not easy on this paper, as I turned it around to avoid the water mark, and the paint seems to sink in far too easily. 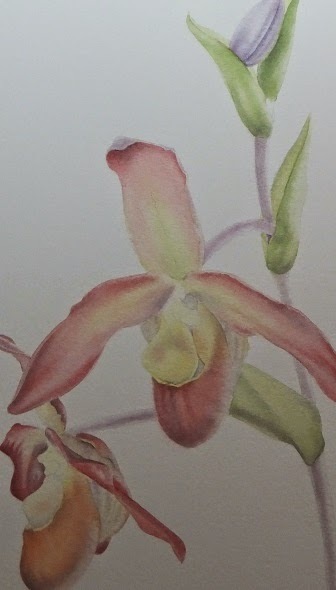 More washes here, building up the colour in the petals and starting to define the markings of the petals and leaves, along with the bud. 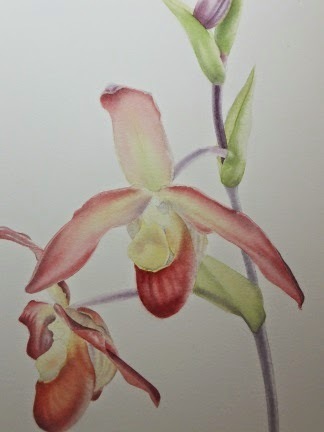 I still have to change the colour of the stems and the bud, but the underpainting is about there. Then I can start on the details - my favourite bit, as that's when it all starts to really come alive. Next time I'll also give the lowdown on the colours I've used and the mixes. Thank you Jarnie, coming from you that's praise indeed!